Your little one is ready to read solo, but which books do you choose? While it’s important to select something that appeals, it is equally valuable to choose reading materials that help your child build confidence. The following titles are some suggestions to help your child start that journey to independent reading. Hug by Jez Alborough is a sweet tale about little Bobo and his quest for a hug. The text contains only 3 unique words, but the illustrations will give your new reader much to discuss with you. Orange Pear Apple Bear by Emily Gravett is a simple book. Beautifully illustrated, the story contains only 5 words. Your child will practice the same words over and over, linking them to the animals on each page depicted in a special way. Gravett’s other stories are equally gorgeous. Try Monkey and Me next if your child enjoys Orange Pear Apple Bear and is ready for something wordier. The Clara and Clem series by Ethan Long is a gentle way to start off on a reading adventure. Clara and Clem Take a Ride includes illustrations that give a feeling of excitement and movement, and the characters are silly with oversized heads and eyes. More importantly, each page holds one sentence, and all but a few are only one word long. Clara and Clem in Outer Space follows the trend with goofy, fun visuals that give the new reader hints to help decipher the text. Most pages have one sentence, and each sentence is no longer than 3 words. Once your new reader has had a chance to dip his or her toes in the reading pool, it might be time to offer some more challenging materials. 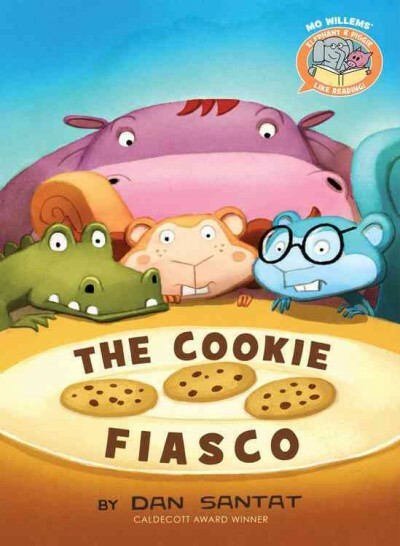 The Cookie Fiasco by Dan Santat is part of Mo Willems’ Elephant & Piggie Like Reading collection, as is We are Growing by Laurie Keller. Both books are amusing and lighthearted, with more text than the previously mentioned books but still designed for beginners. James Dean’s Pete the Cat books are often a favourite. Try Pete the Cat and the Bad Banana for a newer reader. Repetition and supporting illustrations will help your reader develop confidence. This list wouldn’t be complete without mentioning Dr. Seuss. Hop on Pop and The Foot Book are two choices that work well for less experienced readers. Hop on Pop in particular is packed with alliteration, repetition, and rhyme. Children are often attracted to the ridiculousness of Seuss’ stories. Charlie & Mouse by Laurel Snyder helps bridge that gap between picture book and chapter book. If your reader enjoys this collection of 4 adventures featuring 2 hilarious brothers, follow up with Charlie & Mouse & Grumpy. Already made your way through this list? Come visit us at the Library! We’re always happy to help you, and your child, select their next favourite book.